Piano and fixed sound, 2011. 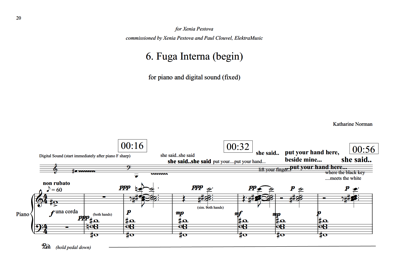 Fuga Interna (begin) is the sixth piece in a series for piano, Fuga Interna, and the first to include a digital part, which also includes a text by myself. The work is about listening, learning to play the piano, my mother, age and memory. The digital part contains a transformed version of the first piece in the series, Fuga Interna (opposed sonorities), performed by Philip Mead – who, by a nice coincidence, at one time taught Xenia Pestova, for whom this piece was written. Please contact me if you’d like the digital part sent to you. You can download the score below. A simple act of causality. I still know the old songs. There is less and less to remember. This is the last (to date) of a series of Fuga Interna pieces for piano. All the works in the Fuga Interna series are inspired by my experience of playing Bach’s Fugue in B minor, from Book 1 of the Well-Tempered Clavier. Like all the pieces in the series, Fuga Interna (begin) includes brief references to those of the set that came before, though it is not necessary to know this to appreciate the work, nor to perform the works in order. The Bach fugue is a constant companion in all my compositional endeavours, and has been for many years.